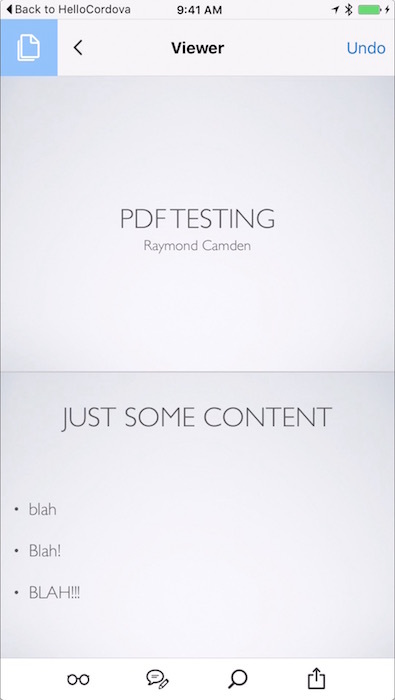 In today’s “I wonder what happens when…” post, I decided to take a look at what happens when you try to use a PDF with a hybrid mobile application. 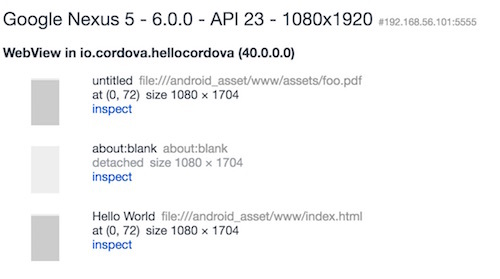 I know that PDFs, in general, “just work” on both Android and iOS, but I was specifically curious about how you would use PDFs within a Cordova app. As usual, what I thought would be rather simple turned into anything but that. A simple link to a PDF. I assume this is simple enough that it doesn’t require explanation, but let me know in the comments if anything seems off. Ok, let’s test iOS! 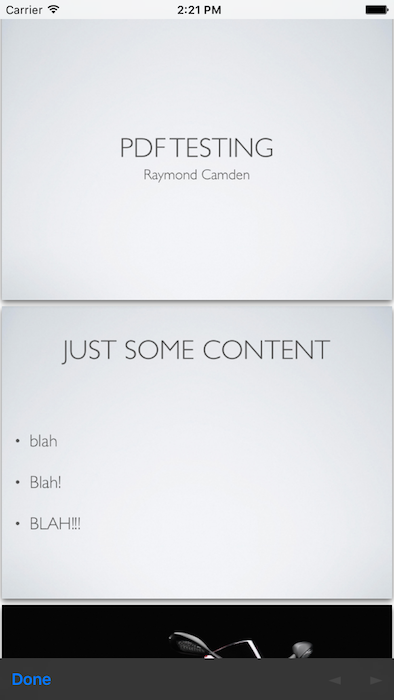 Yes - the PDF is rendering beautifully. 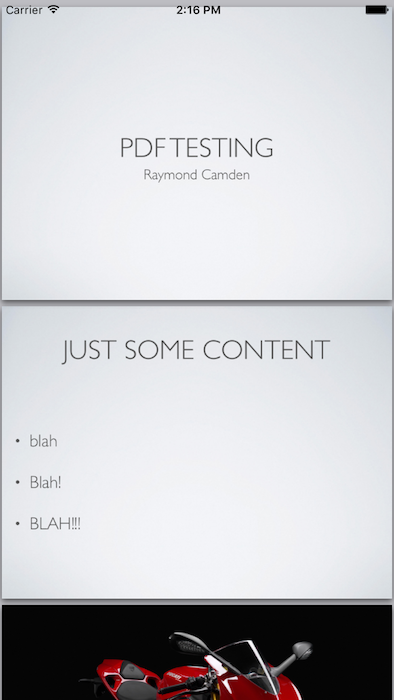 (And it’s easy to read, but to be fair, I use a Keynote slidedeck as my source.) However… notice something missing? Yep - there’s no way to get back to the app. 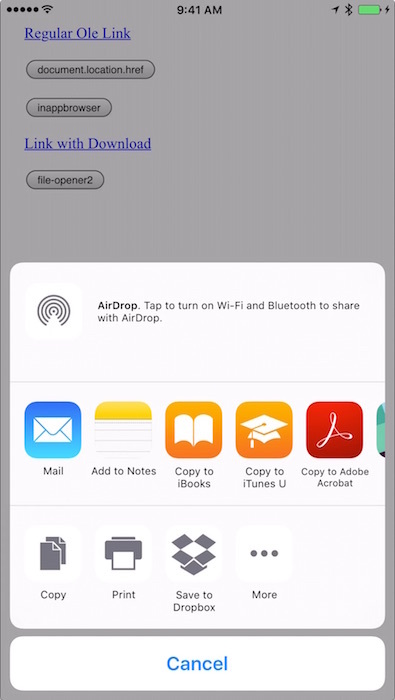 Technically you’re still in the app, but the entire webview is the PDF, and since iOS doesn’t support a Back button, you’re screwed. I had to kill the application to get it back to normal. In case you can’t see it, there is a bar at the bottom with a “Close” link that will bring you back to the app. Ok, so that’s easy - Android will probably respond the same. Let’s take a look! Resource interpreted as Document but transferred with MIME type application/pdf: "file:///android_asset/www/assets/foo.pdf". Weird. 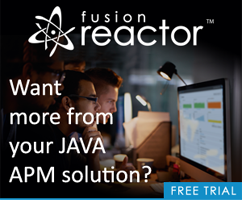 I’ve seen issues with dynamic apps (ColdFusion) outputting binary date without the right content type, but if my memory serves me right, normally the browser just tries to handle it as best it can. In the past (far past) I can remember browsers trying to render the binary data as text, but it seems like I’ve not seen that in quite some time. Correction - I decided to actually test that hypothesis and desktop Chrome barfed on ColdFusion outputting a PDF without the right header. Chrome, Safari, and Firefox all crapped the bed trying to load it. It turns out that the Android web view simply doesn’t support PDFs. That seems… crazy - especially considering how many PDFs are out there. One could argue that they probably don’t fit the mobile form factor very well, but I’d have assumed that showing something would be better than nothing. And heck - I’m sure Google could license a PDF viewer from Adobe. They probably have enough money for that. Ok - let’s try Android. It’s going to work. I bet. Sigh. I did some digging on the plugin’s GitHub issues though and ran across this report: Opening local file (pdf) : “not found”. Which implies that it simply couldn’t find a PDF viewer on my Android simulator. I’ve got a device, but I’m at an airport currently and the device is back home. Considering multiple people up voted the idea, it seems like a good solution. Of course it doesn’t work on iOS because, reasons, but at this point I’d simply consider using an IF/ELSE with the device plugin. At this point - I consider the issue solved - roughly - and hopefully this will be of help to others. Thanks again to Simon for his help with this plugin! No back button in your Ionic header?